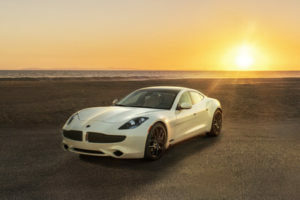 Luxury electric automaker Karma Automotive announced on October 23, 2018, in California, the Aliso Edition – a new and very limited offering that expresses the elegance and fluid lines of its Revero. Only 15 Aliso Editions will be produced, all individually numbered with unique interior and exterior badging, special exterior paint, interior leather-trim colors, and custom carbon fiber wheels. Starting on October 23, 2018, Aliso Editions will be available for sale from select Karma Automotive’s dealers located across the United States and Canada with delivery starting the following month. The Aliso name is embroidered on the leather seats, and the exterior is badged with Revero Aliso. The pure, ceramic-toned leather provides a delicate accent between sea and sand on the seat backs. The ceramic accent also extends to the doors, providing balance to the overall color scheme and a nod to the exterior body color. The dark leather of the center console and steering wheel is contrasted by the sun-colored thread for stitching, while bone thread is used on the leather pieces. The Aliso Edition also features sustainably sourced platinum and red burl wood finishes, on the console and dashboard. Aliso Edition’s leather is sourced from the oldest family-owned leather company in the world, Bridge of Weir in the Lowlands of Scotland. The hides are sourced in Scotland, the UK and Ireland and are tanned using a chromium-free process in an operation committed to eliminating waste through efficient resource use, recycling and energy recovery. Aliso Edition’s exterior paint color, Laguna Pearl is a special formula requiring a complex layering system of glass flakes, a celebration of the sun’s sparkle over the ocean’s crest. The Aliso Edition also sports black CarboTek wheels and Brembo calipers in dark metallic orange, a color that ties back to the special edition badging. Karma Automotive designs, engineers, assembles and markets luxury electric vehicles, all from its Southern California base of operations. This newish company founded in 2014 employs nearly 1,000 people worldwide. Karma Automotive draws on global relationships and technology partners to achieve growth in the luxury mobility experience for customers. 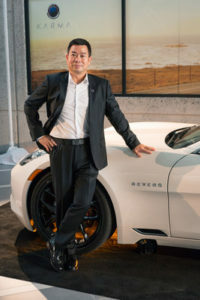 The Aliso Edition is assembled in Southern California, at Karma Automotive’s dedicated plant in Moreno Valley and has a manufacturer recommended retail price (MSRP) of US$145,000. Retail deliveries are expected to start during November and conclude prior to Dec. 31, 2018.